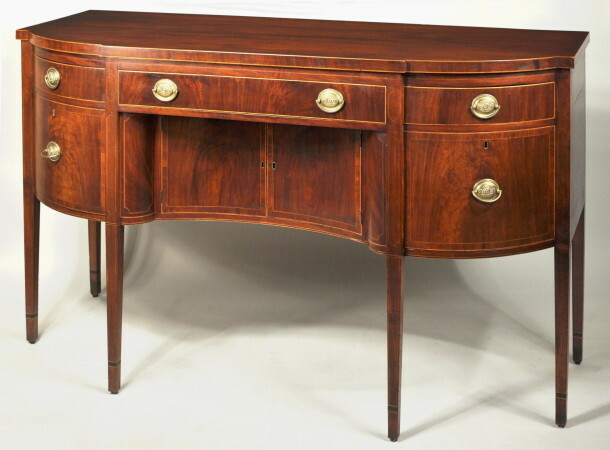 Fine hepplewhite inlaid mahogany "D" shaped sideboard, the top with string inlaid upper and lower edges, set on a conforming case with one long central drawer and two convex end drawers, above a recessed concave two-door cabinet section flanked by two fitted bottle drawers, set on square tapering legs with string inlay and inlaid cuffs. Vibrant figured mahogany veneers, dark figured mahogany crossbanding, and string inlays on all doors and drawers. School of Aaron Chapin, Hartford, CT, circa 1795. 70" long, 41" high, 29" deep. Fine original condition with mellow older shellac finish. Minor repairs. We have owned three other related sideboards, one having a signature documenting it to the shop of Aaron Chapin.